Tonight is Christmas Eve. They old timers used to say that, “The animals talk at midnight on Christmas Eve!” Many times over the years I have tried to witness this fact. I can tell you that if you sit on a hay bale in the barn, waiting for midnight, it doesn’t work. The animals know that I am there and they won’t say a word. I have also missed it before, because I fell asleep waiting on the midnight chime…they probably talked that night, but I was in dreamland and missed it! You can’t sneak up on the stable in the crunchy snow either. The critters have good ears, they hear you coming a mile away. You can’t cough or trip over the dog…both will alert the animals. They are crafty beasts with an ancient secret…but I believe, they do talk at midnight on Christmas Eve! As for me and grandma … We Believe! There is no way that three, is a crowd! What a whirl wind couple of weeks it has been. Like all families at this time of year, we have been busy! There was shopping to do and cookies to bake. The tree to decorate and the house too…. Thankfully, I didn’t have to do any of those things…thanks to my dear Connie. I did help a friend butcher a very big beef, get our maple sap bags ready to go, kept up with chores and birthing pig babies. 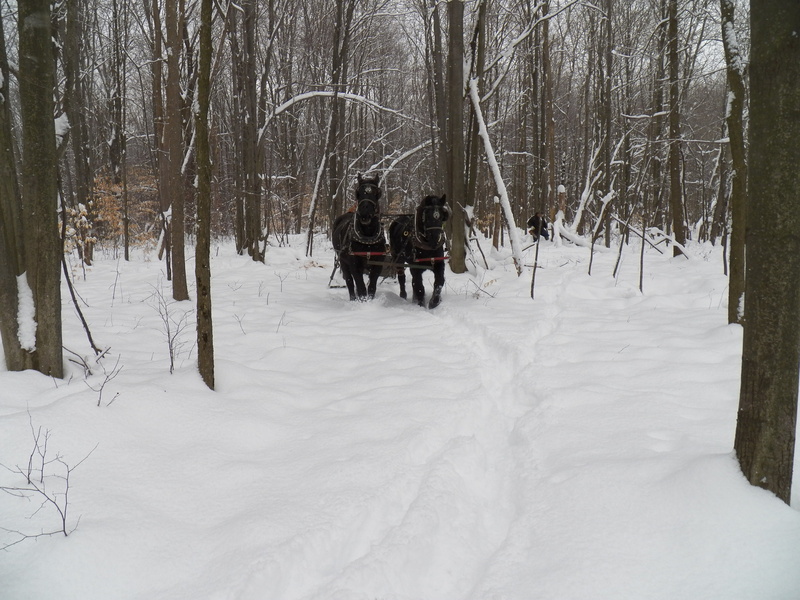 I have shoveled mountains of manure and snow. We put a ceiling in the old shop and moved sheep to different pasture. Sadly we attended funeral services for a great friend. He was our local fire chief, township trustee and fellow farmer. I will miss John Wayman. I also had to deal with the grief of losing my best friend and canine pal “King”. He had been my constant companion for two and a half years. A condition required us to have to put him down… I am far from over it and just didn’t feel much like writing these past couple of weeks. Great rains overtook us and melted all of the snow. The farm is saturated once again with water. Mill Creek has been out of its banks for several days, but the water is finally going down. They say a freeze is once again coming, but a white Christmas may elude us this year. 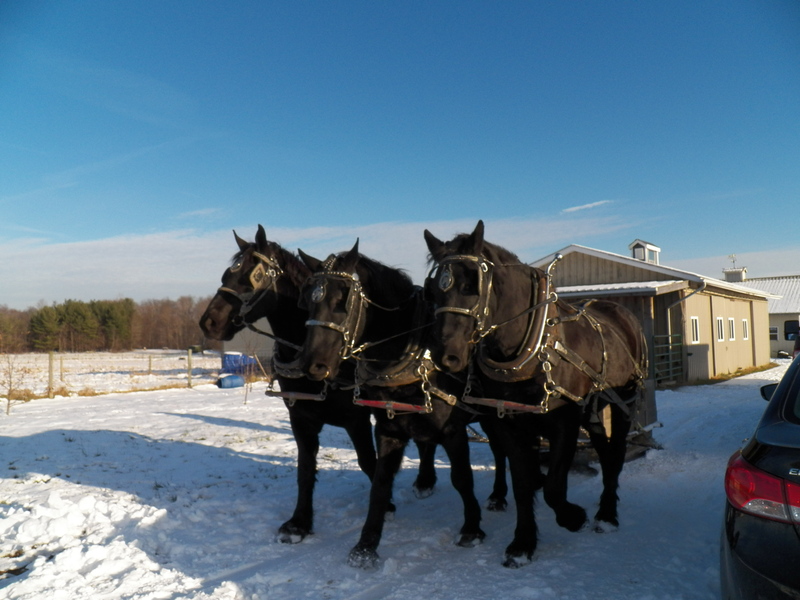 I want to take just a line to say Merry Christmas to all my readers, from all of us here at the farm! Today, I set aside a day for me. Sure, I did my chores and a few other “must do” jobs, but then I just did what I wanted. I can almost say I wasted part of a brisk, cold day … but it wasn’t wasted at all, I used it for my mental health! I messed with my horses, played with the newborn piglets, romped with the dog and got my back fixed. I took a walk in the pines and listened to God’s music in the branches. I let my mind rest while my fingers chilled a little bit. Then later, I warmed those fingers around a cup of tea. It was a day for me and I am so much better off for taking it!! Tomorrow is my birthday. Today is my last day to be fifty-four. It’s just a number they say and I believe “they” are right. I don’t know where time goes…but it sure does go! I think the secret to not caring much about your age, is to live each day like it is your last one. Stay in touch with people you love and who love you. Enjoy every minute of the day you have been given. Laugh in the rain, bask in the sun and give of yourself. Use your talents and share with everyone. There are days when I don’t follow my own advice. Those days are usually unhappy, or at the very least, frustrating ones. I try not to have days like those, but life happens. The key is to have the least number of unhappy days possible. My grandparents were killed in their early fifties. That is a young age to have it all end, BUT…they had such an impact in my life that I cannot measure it. I know they were poor by many standards, but I didn’t know. They had food, all the conveniences of any home at the time, the lights were on, wood heat made the house warm and we watched television in the evening. I think it was all the love in that house that made it complete. I struggle sometimes to find that happy place. When the world pushes from all directions it’s tough to be the one smiling. I don’t like”drama”. I would rather fix a problem or move on. Many times, the answer is to just move on, let things alone and just forget about it. Many wounds don’t fester if you don’t pick at them. If I was to give any advice to anyone, that advice would be to find the things that make you happy. Put your hands to work at what your heart desires. It will give your life balance. If you can’t farm at your place in town, have a garden, raise strawberries, compost your leaves, but spend a little time each day playing in the dirt. It will ground you 😮 It will keep your soul happy while you work out the future details…. It worked for me! I hope to have many more years to laugh and love. I would ask for decades to farm and share my talents with anyone, in person or in print. I will live each day with those things in mind and be ever thankful for what I have. Some say that I don’t “farm”, but there are cattle grazing in my pastures, sheep grazing and breeding in the lane, sows farrowing in the deep straw and horses waiting to be hitched. My breakfast of eggs, potatoes and ham was grown on this place as was the maple syrup on my oatmeal. So, I’ll just wave at the folks who think I’m just playing around here…I’d say hello…but I’m chewing! I guess what I’m trying to say is this; go forward doing what you want to do. Don’t be sidelined by the ones who say, ” it can’t be done.” They don’t know the inner you. It may not be easy, whatever you set your mind to, but don’t give up. If you want it, it can be done! Smile at the nay-sayers, as you sink elbow deep into what you love! Remember, none of us know the number of days we may get, but we can control how we spend them. Life is a bunch of choices. Choose to be happy. Spending time on the negatives only takes away from the positives…let the bad stuff go. Focus on the future … and go get it! It is so slippery that I decided not to work the horses today. 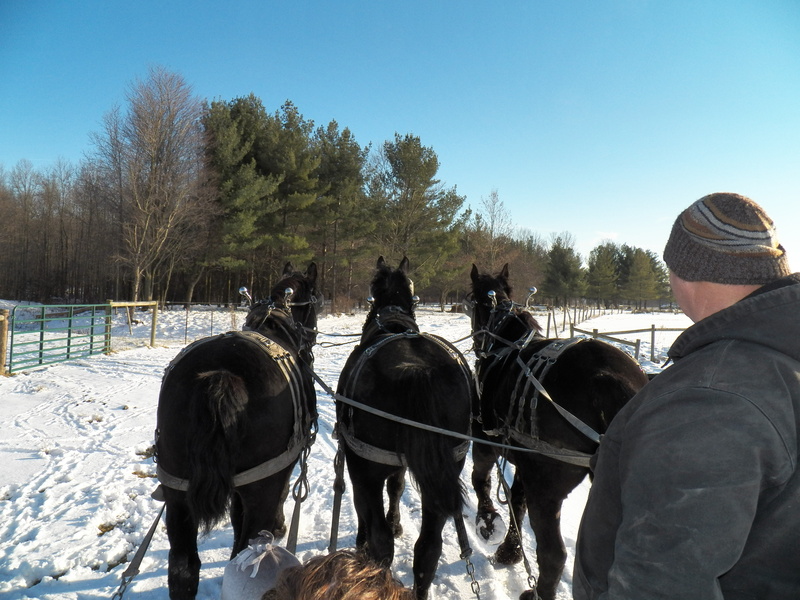 The fields are fine, but the drive around the barn and farm is too slippery to stand up on…for long. My horses are barefoot right now. It is much better, in my mind, to do other work, than to have an accident where a horse breaks its leg. The round bales in the pastures for cows and sheep had to be chopped open this morning. I am sure they were happy to see me with the axe. All is good now, except for the drive, even the sun is shining. Our winter weather this year has been a reminder that we are not in charge! I was going to do some butchering today, but decided that sliding around with a sharp knife in my hand would wait for a better day. A little snow or a little more sun and we will be fine. I say we are lucky compared to those without power and worse. I will just take it a little slower and wait for a day… it will surely change by then, but in the meantime…man it is slick ! We currently have two litters of nine. The moms and babies are doing well. Today, I cleaned the pens and quite a bit of the nests. I just remove the wet and soiled stuff. I do not take it all. I then add chopped straw. The short straw is best for the moms with newborn babies, because the babies can become entangled in long straw or hay. The mothers usually chew the bedding into short pieces as they wait for the birth of their young. After the babies are born, they don’t have a lot of time it seems. 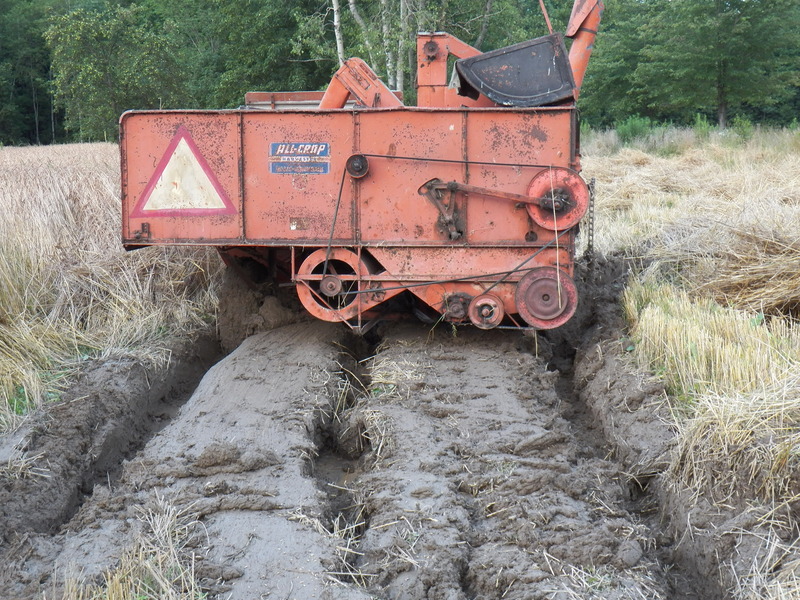 I help them out with the short, chopped straw…. it’s better for both of us! If a small baby gets tangled up, he can get stuck out by himself where the lack of body heat will kill him on a cold night. Another problem can be when mom wants to lay down. She grunts to the wee ones and they know to get out-of-the-way. She lays down and slowly rolls onto her side to offer supper to the babies…. 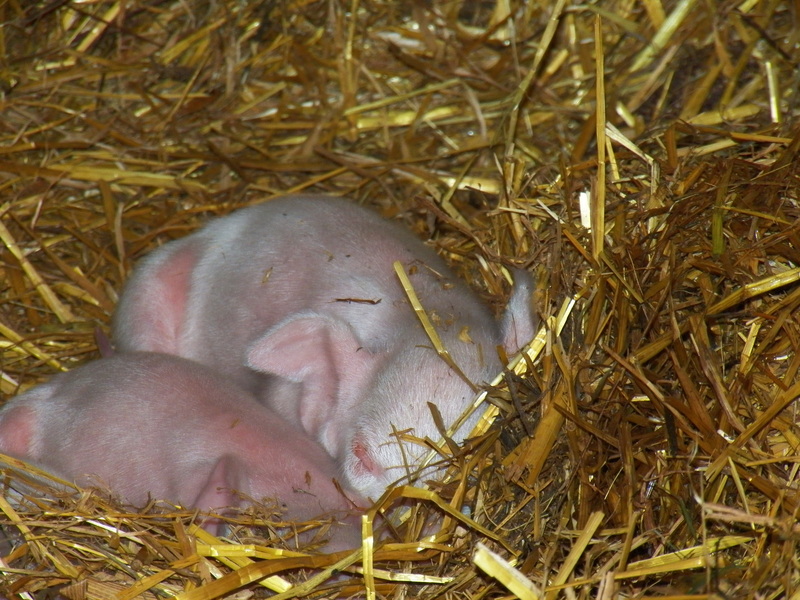 a tangled piglet becomes very flat as the life gets squeezed out of him…. it is much nicer to use short straw, at least when they are tiny. The mothers take the fresh, dry straw and line the nest, then they sort of fluff it along the edges. The babies become experts in burrowing down and covering up. It is amazing how the whole process works. I am thankful for my crop of speltz. It not only provides all the grain for my draft horses, but all the straw we need too! 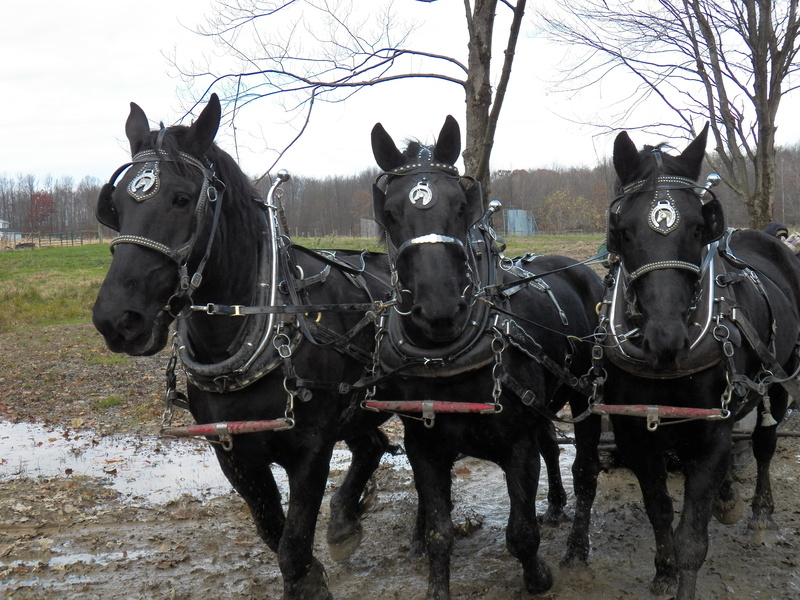 I do buy some of the chopped straw, right off the thrashing machine, from an Amish friend. 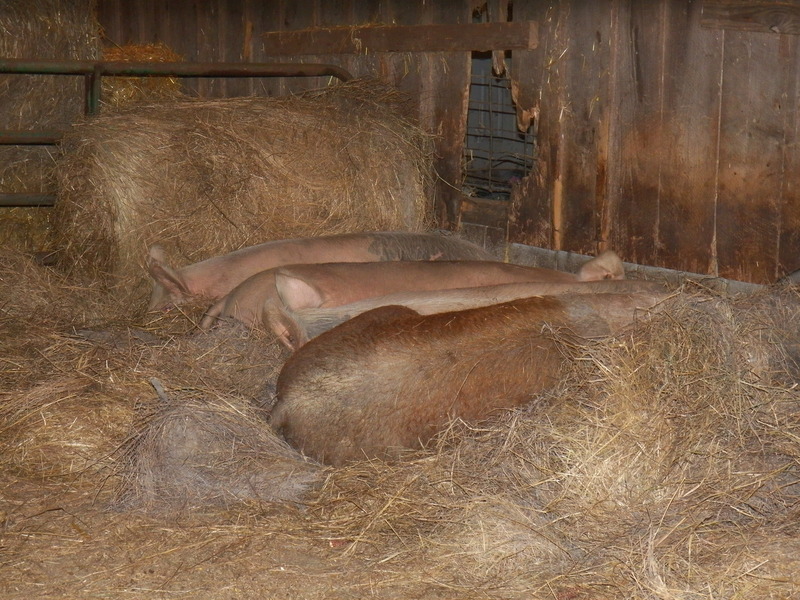 I only need enough of that for farrowing time…all the rest is grown here. That straw is the anchor of our compost pile. The carbon it provides locks up the nitrogen in the animal manure. It is returned to the farm’s topsoil, ready for the plants to use. It’s funny that we call it “bedding” because the animals lay down in it…but the babies cover up with it…kind of like a big yellow quilt…and we all know how much warmth and love a quilt provides !